Coll. No. 1292, 9 Sep 2015, characters observed: Perennial herb, to 40 cm., short white hairy throughout; Leaves, basal, withered (late in season), cauline, alternate, 95 mm. × 9-10 mm. wide (includes 15 mm. winged petiole? below) veins, 1 (others discontinuous), margin hairs similar to surface hairs, i.e., not ciliate, gradually reduced and sessile above; Inflorescence, heads numerous and small, involucre, 5.5 mm. ; Phyllaries, 3-4 series, imbricate, graduated, 3-4 mm., veins 1; Receptacle, epaleate, (scales? to 0.5 mm. ); Flowers of 2 kinds; Rays, few (3-4), fertile? (stigma visible but cypsela not as developed as those of disk flowers), corolla, 6 mm., yellow; Disk flowers, few (6-8), corolla, 4 mm., yellow; Pappus, capillary bristles; Cypsela, 1.5 mm., short hairy. Field Notes: Coll. No. 1292, 9 Sep 2015. 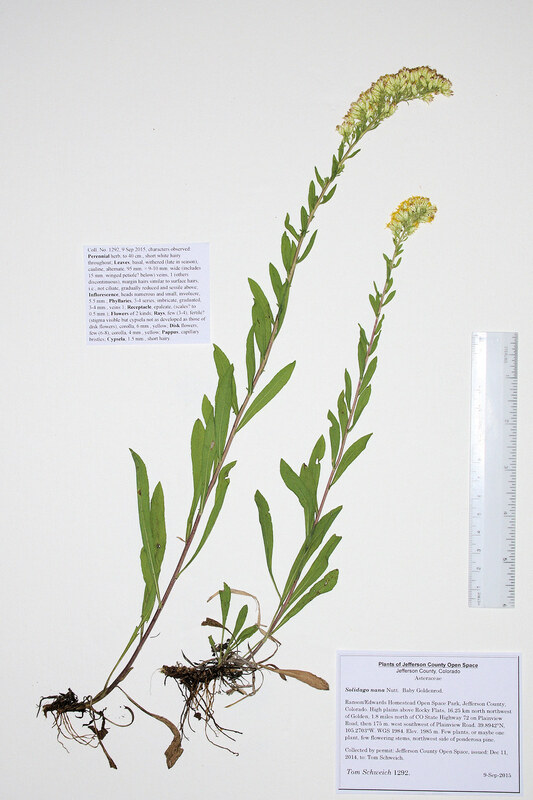 Other photos about Species - Asteraceae or Solidago nana.